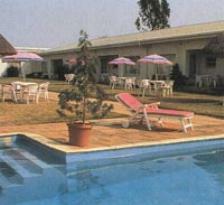 Cresta Botsalo Hotel is located In the hot dry expanse between Gaborone and Francistown in the town of Palapye. Cresta Botsalo is the social centre of Palapye, which was once the Capital of Khama III before he moved to nearby Serowe, which is still the seat of the Bangwato Tribe and the site of Sir Seretse Khama's grave. Cresta Botsalo with its luxury facilities and fully air-conditioned rooms is ideal for tourists visiting this historic area. Today Palapye is the major commercial town in this central district, serving Morupule, Serowe, Mahalapye and Orapa, making the Cresta Botsalo a perfect base for local businessmen, who can also benefit from the full conference facilities offered. 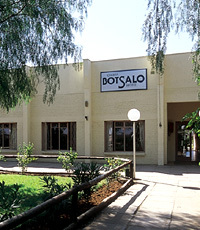 Guests can enjoy the Cresta Botsalo hospitality, with a swim in the sparkling pool and a drink at the Pool Bar or in the charming Palapye Sands Cocktail bar. The Palapye Grill offers a deliciously varied selection of fine foods, complemented by a wide choice of imported wines. 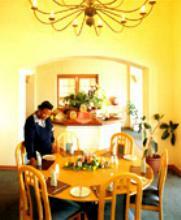 51 air-conditioned bedrooms with radio, television, video channel, direct dial telephone and shaver outlets. Palapye Grill: Seats up to 50 guests and offers Continental and full English buffet breakfast and an à la carte menu for lunch and dinner. Pool Bar: Seats 50 and serves drinks and light snacks. Cocktail Bar: Seats 30 and is open till late. The Morupule Conference Room seats up to 150 delegates. Audio visual equipment is available and includes a colour television, video recorder and overhead projector. Gift shop, video outlet, outdoor swimming pool set in African style gardens, camping area, secretarial services, safety deposit boxes, same-day laundry and dry cleaning and assistance with tours.